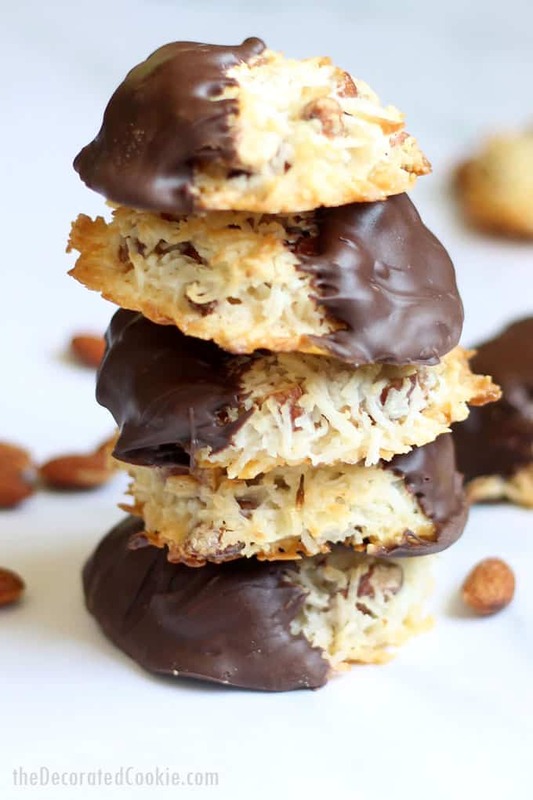 Almond Joy cookies with coconut, almonds, and chocolate. 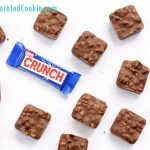 4-ingredient almond joy cookies: The flavors of the classic candy bar, baked into a delicious cookie. 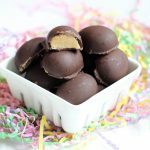 If you like the classic Almond Joy candy bar, you’re going to absolutely love these Almond Joy cookies. You have the same flavors as the candy—sweet coconut, crunchy almonds, and rich chocolate—but baked into a perfectly-toasted cookie. And with only four ingredients, these cookies are a cinch to whip up, even as a last-minute party treat. 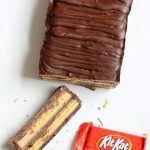 Mounds and Almond Joy candy bars are currently produced by Hershey’s, but originally, they were created by the Peter Paul Candy Manufacturing Company. The Mounds bar was introduced in 1920 and was a hit with military members later during World War II. Almond Joy was introduced in 1946. 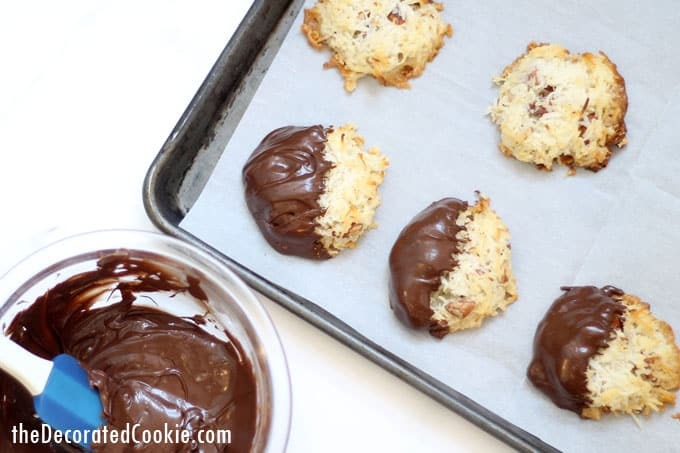 A few notes and tips on this recipe: To create the Almond Joy cookies, I use my two-ingredient macaroon recipe, which combines coconut and sweetened condensed milk, and is baked until golden. 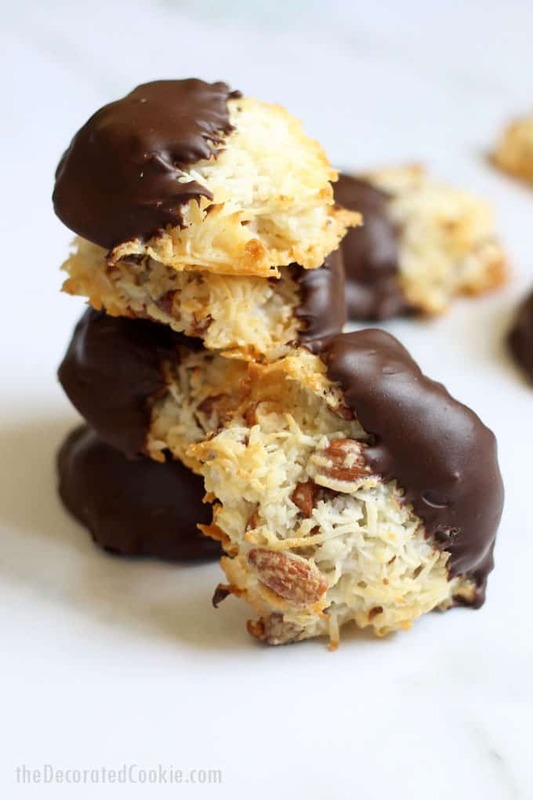 I simply added almonds and coated in chocolate. The toasted coconut mellows the flavor, so I prefer these cookies even to the store-bought candy. I add salted almonds, instead of unsalted, because the salt is a perfect balance to the sweeter ingredients, especially the sweetened milk. I use an ice cream scoop lightly greased with vegetable shortening to make the mounds, but you may also use a spoon or your hands. If, after baking, you noticed some of the condensed milk has oozed around the cookie, use a small, sharp knife to remove the extra bits as soon as you remove the cookies from the oven. By the way, sometimes you feel like a nut, sometimes you don’t. Almond joy’s got nuts. Mounds don’t. (Anyone remember the Almond Joy and Mounds commercials of the 1970s? The jingle was written by Leo Corday and Leon Carr, sung by Joey Levine.) 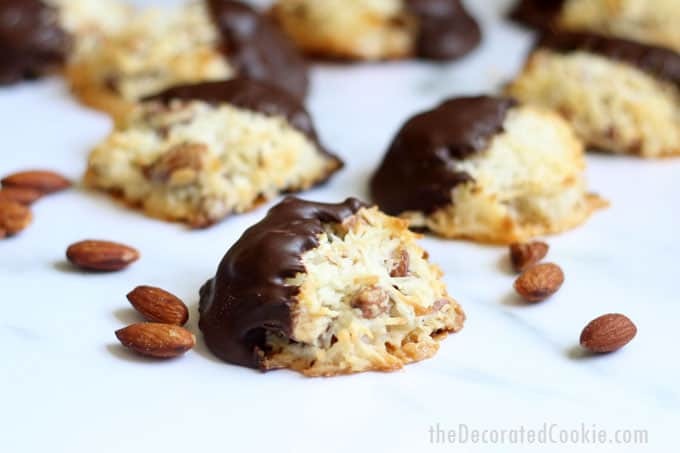 If you don’t feel like a nut, you can make “Mounds cookies” by leaving out the almonds and using dark chocolate chips instead of semi-sweet. 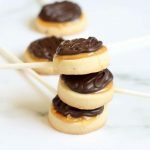 If you like this recipe, you’ve got to try my Twix cookie pops. So so so good. And if you’re a booze fan, try my rum boozy fudge with coconut . 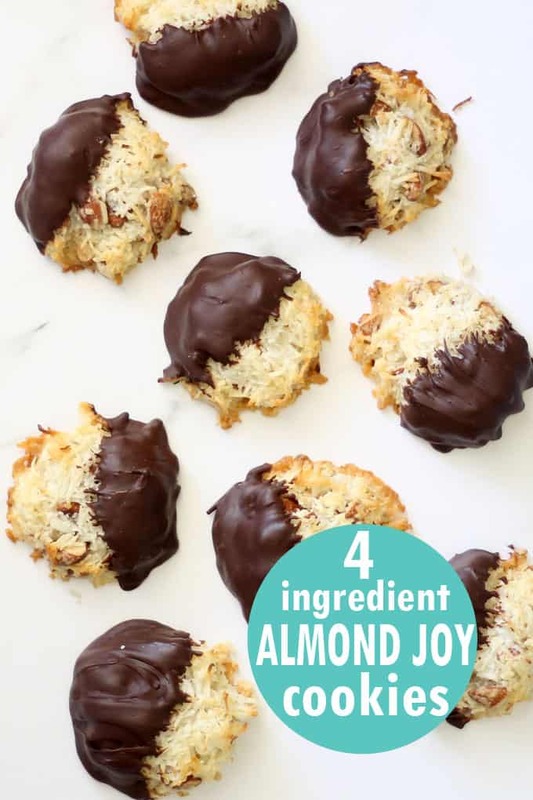 To make Almond Joy cookies, combine a 14-ounce can of sweetened condensed milk with a 14-ounce bag of shredded sweetened coconut. Add 1 cup coarsely chopped salted, roasted almonds. 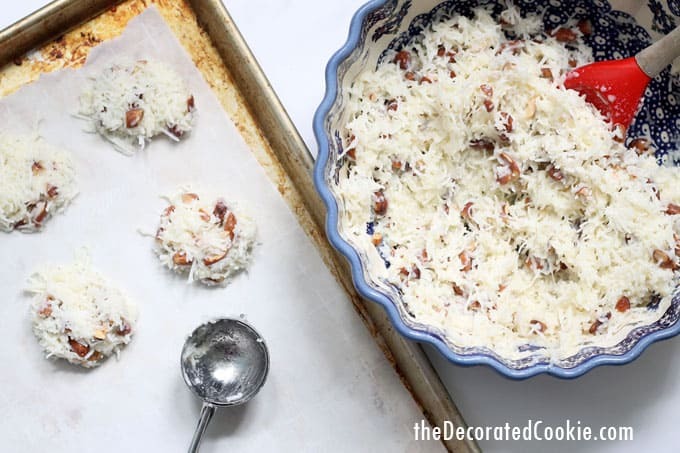 Scoop onto a baking tray lined with parchment paper and slightly flatten with your hands. Bake at 350 degrees F until golden brown (about 15 minutes). Dip in melted chocolate and let set in the refrigerator or at room temperature. Makes 18 to 20 cookies. 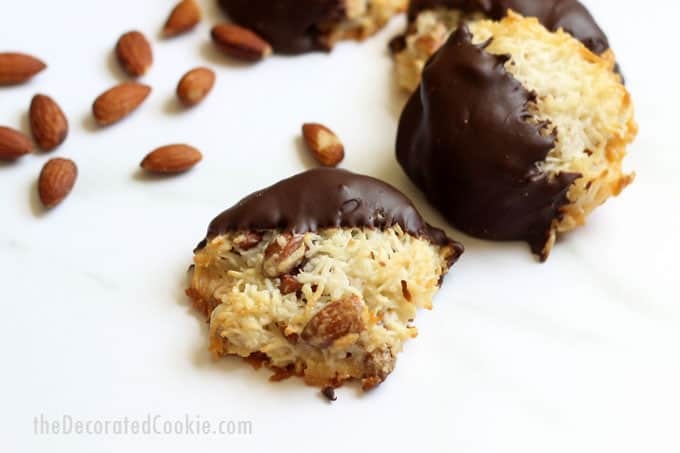 This post for Almond Joy cookies also appears on Food Fanatic.